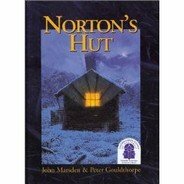 John Marsden Review: Norton's Hut was released back in the year 2000. Norton's Hut is about a group of six young hikers who trek through Australia's high country. They take shelter from an approaching blizzard in an old hut, which is nestled deep in a valley. Norton's Hut is one of the first books I reach for when I work on shared reading activities with older children. The text is spare and poetic and is written as verse. The language is sophisticated and can be a challenge for younger readers to understand. The book often needs to be read several times by students before they can grasp the story's deeper meaning. I enjoy deconstructing that imagery with children with language impairment. The image of the clouds churning and a great boiling of weather is a masterful use of metaphorical language, and conveys breathtaking beauty and approaching danger in equal measure. This John Marsden review would not be complete without mentioning the illustrations by Peter Gouldthorpe. The illustration are painted in oil and each panel is a work of considerable beauty, almost photo realistic. The detailed imagery of the Australian Alps is very accurate. Having hiked a number of times through the Australian Alps, I instantly recognized the unique yellow grasses, the twisted foliage, the contorted cloud formations and the myriad blues and greens of the alpine country. Norton's Hut is an at times spooky story of Australia's beautiful high country. The text is spare but expertly constructed by one of Australia's best writers for young people. Highly recommended as a shared reading text for older students - between the ages of 9-14.